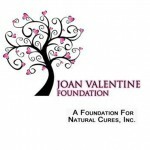 What We Do | Joan Valentine - A Foundation for Natural Cures, Inc. The Joan Valentine – A Foundation for Natural Cures, Inc., explores new ways of healing people with cancer through integrative medicine, meaning any healing practice that does not fall into the realm of conventional medicine. The Foundation believes creating awareness and education regarding integrative and alternative healing can benefit individuals and their families. The Joan Valentine Foundation promotes healthy living and lifestyle wellness, integrative healing as it applies to every facet of life, and alternative health and healing for those afflicted with cancer. Through education and research, the Foundation affords individuals the ability to make informed lifestyle choices. It is our firm belief in an integrative approach for the treatment of cancer that includes complementary therapies and body/mind/spirit approaches, and blending science with the art of healing. Furthermore, the Foundation is committed to evaluating the scientific foundation of complementary medicine, educating health professionals and the public, and integrating evidence-based complementary therapies into clinical care to help people achieve and maintain optimal health and well-being. The foundation was formed in 2009 when Dianne Burnett’s mother, Joan Valentine, was battling esophageal cancer. She was by her mother’s side until her mother passed away on April 20, 2010.